The debate host said it was probably the "friendliest" moment of the event. 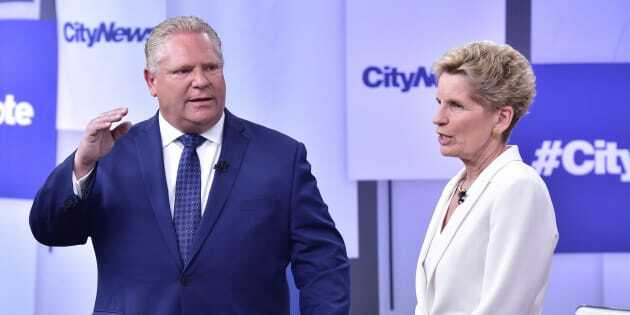 Liberal Premier Kathleen Wynne, right, and Progressive Conservative Leader Doug Ford take part in an Ontario Leaders debate in Toronto on May 7, 2018. Ontario's political leaders faced off Monday evening in the first debate ahead of the province's upcoming election. Ontario Premier Kathleen Wynne, NDP Leader Andrea Horwath and Progressive Conservative Leader Doug Ford participated in the event hosted by CityNews in Toronto. The event's format allowed each leader to ask a rival one question of their choosing. Wynne and Horwath both chose to grill Ford on his vows to cut government size and spending — or find "efficiencies," as he puts it. The two leaders have repeatedly said Ford's plan will result in thousands of job cuts. When it was Ford's turn, the recently-elected PC leader turned to the premier and said: "Kathleen, you got a nice smile on your face there." "So do you," Wynne replied. "When does the clock start?" Ford asked debate host and CityNews journalist Cynthia Mulligan. Though the comment created a bit of an awkward silence, there was some laughter when Mulligan said the exchange would be the "friendliest moment" in the debate. When Ford eventually continued his statement, he told Wynne he believes she got into government for the "right reasons." "When did you lose your way?" he asked. Ford's "smile" comment didn't sit well with some viewers following along with the debate. Some saw the remark as a "gross" or awkward line, while others blasted it as patronizing or "mansplaining." So glad that Doug Ford is letting the women know he likes their smiles. Gross. No one cares Doug. We have a smart, savvy, accomplished Premier in Kathleen Wynne. All Doug Ford had on offer was mansplaining and weird comments about her smile. After the debate, Wynne was asked about Ford's comment during a scrum with reporters. "There are many of us who have come to expect that kind of comment, that kind of behaviour," she said, adding that the remark was not a "substantial" discussion of policy. The CityNews debate is the first of three showdowns between the party leaders ahead of the June 7 vote.